My birthday was a couple of weeks ago and one of my friends gave me the plaque that is pictured above. I laughed when I saw it and then found an appropriate place to display it. I have been thinking a lot about friendship and decided to share a few random thoughts. 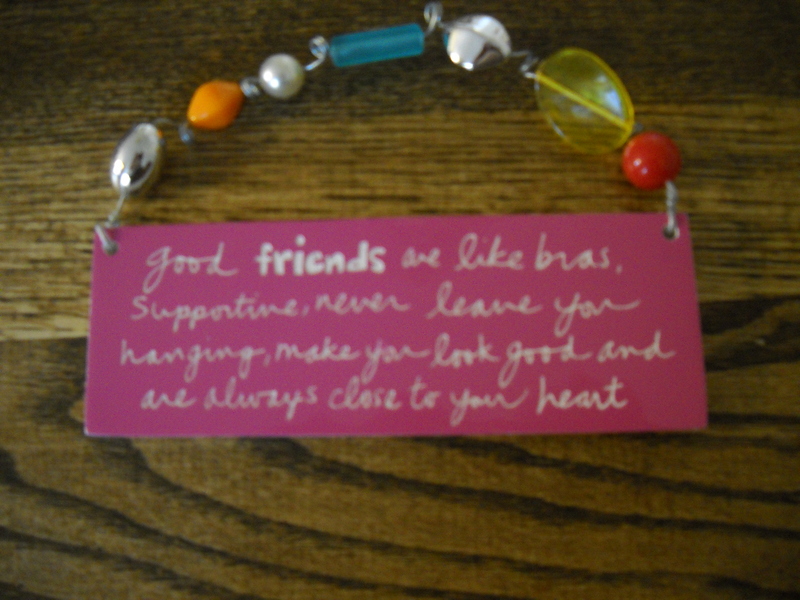 Friends are a gift and should be treasured. There a many friends you can spend a few hours with.There are fewer friends that you can spend the whole day with and still fewer friends that you can spend a week with. A friend is honest but not hurtful. Friends multiply our joys and divide our sorrows. Sometimes you have to do what is best for the friendship not what is best for you or the other person. “Greater love has no one than this, that he lay down his life for his friends.” John 15:13 When I had breast cancer, my friends “laid down” their lives for me. They poured into my life in ways that were above and beyond. Friends add different things to your life. One isn’t necessarily better than the other. My FDNY widow friends understand things that not all of my friends can understand. We laugh about things that may seem inappropriate if you hadn’t walked in our shoes. My Tribute Center friends share an experience that is not easily understood and doesn’t have to be explained. Not every friend needs to know or can be trusted with all the details of your life. An example would be Facebook friends. Social media is great but maybe you shouldn’t share that information with Facebook friends. I think of friends as being in circles like a target or bullseye. Some are closer to the center than others. The inner circle is small. Your friends have friends. That doesn’t make them “less” of a friend to you. Difficult concept for preteen girls. Chatting with friends is great but friends who can be completely comfortable with moments of silence are rare and few. I am truly blessed with wonderful friends. I have my inner “circle”, and my close circle and then all those other circles that compliment and enrich my life. When I was teaching dance I would always say “within the four walls of this studio, you are friends. I don’t care what happens when you leave but within these walls we will treat each other as friends and friends are a gift.” Guess what some of those girls became friends with people they never thought they would be friends with. This is a little off topic but I have been pondering the mutual respect that everyone at the Tribute Center has for everyone else’s stories. We share a common experience and in many ways that is all we have in common but we respect and value each other. I have been thinking as human beings don’t we all share the common experience of life. Shouldn’t we all respect and value each other simply because we are people on the journey of life. In my dictionary the word friend has your picture for a definition :). Are you facebook stalking again? My dictionary has your picture as the definition.